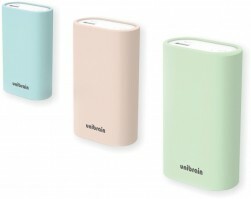 The Unibrain 11000 mAh portable fast charge power bank is available in three silicone covers (pink, green and blue). Weighting only 240gr makes it portable and suitable for all occasions when extra power is needed. Indicatively, when fully charged, it can charge an iPad 9.7″ once, an iPhone 7/8 around 4.5 times, an iPhone Plus or iPhone X or Galaxy S7/S8 around 2.5 times. With a blue led indicator and an on off power button you can see the charging status and the remaining capacity at all times. It comes with a Colorful Rubber Cover and a Micro USB cable. Package includes: One Power Bank, One USB charging cable and manual.